Football season has officially started. Over 30,000 LSU fans have returned from Dallas and thousands more are preparing to be on LSU’s campus this Saturday. 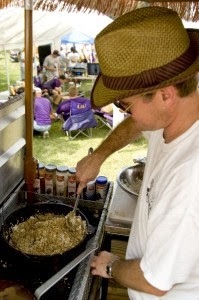 Whether you have seats in Tiger Stadium or in front of a TV under a tent, here are a few suggestions for tailgating in style. Tiger District – An online secret you’ll be glad to know. T-shirts and tanks for both men and women featuring simple designs and bold lettering that stand out to everyone who sees you. Gameday t-shirts are also their specialty. Deals include buying a game shirt before the design is revealed for a discounted price or the entire season of game shirts for an even bigger discounted price. For more gameday shopping ideas in Baton Rouge click here. Ambrosia Bakery – Ambrosia is the home to the purple and gold sandwich tray. Keep your tailgate crew fueled with either a small or large sandwich tray in your choice of meat. Cookies iced to look like tiger paws or LSU football helmets are also festive for the occasion.